Klim built their brand on tough, no-nonsense principles. Those principles trickle down into their gear. For years, the Adventure Rally system has built a reputation for being the most robust and versatile riding system on the planet. It’s designed for riders that push the limits of their motorcycles, their bodies, and their minds. It’s designed for riders that push themselves to the edges of the earth. New for 2014, Klim introduces an updated version of the Adventure Rally system. Diving into the technical nuggets, we start with the exterior. The Adventure Rally’s exterior shell is made of Armacor. Armacor is a highly abrasion resistant textile fabric backed with a laminated Gore-Tex membrane. Armacor also has small Ripstop grids throughout, “beefing up” its integrity even further. Klim reinforces the Armacor textile in the impact areas with a new Superfabric blend. In the previous version of the Adventure Rally, Klim used Talisman in the impact areas. Talisman has great abrasion resistant properties, but was a bit too thick and heavy, which limited riders mobility. Klim has sourced a new batch of Superfabric that’s lighter, more flexible, and maintains a high levels of abrasion resistance. The Klim Adventure Rally uses the highest level of Gore-Tex waterproofing, 3 Layer Pro Shell. The best way to understand Gore-Tex Pro Shell is to grab an Oreo cookie. The two chocolate sides of the Oreo represent textile material. The cream filling represents the raw Gore-Tex membrane. Laminate the three layers together and you get Pro Shell. Pro Shell manages internal humidity and moisture levels 20% better than other Gore-Tex applications. In addition, because Pro Shell Gore-Tex is laminated on both sides, it’s much more durable and much less bulky than a floating or removable liner. 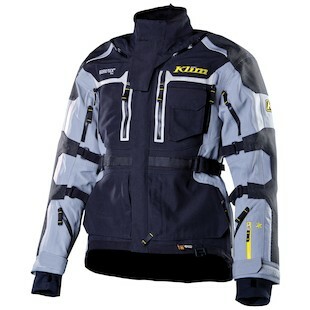 Klim continues to make comfort a priority without sacrificing technicality. Klim updated the protection of the Adventure Rally from CE Level 1 T5 D3O armor in the elbows, shoulders, hips and knees to CE Level 2 XERGO D3O armor. The new XERGO armor passed CE level 2 testing with flying colors. It has better coverage than the T5 armor and larger holes for better moisture wicking / ventilation. The XERGO armor compliments the breathable Gore-Tex Pro Shell better. The CE level 2 T5 D3O back protector remains the same. 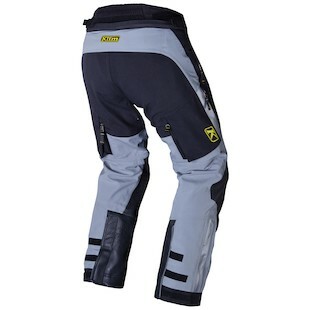 Klim improved the storage / pockets for 2014. The new Adventure Rally has 2 additional quick-access tool pockets in the jacket. Furthermore, the two external thigh pockets in the pants are repositioned for easier access while sitting on the motorcycle. The full system has a total of 13 external water-resistant pockets and 4 internal pockets to haul a full load wherever the adventure takes you. Supporting the full load is an internal support system. The internal support system includes a full harness with kidney belt. Next up is adjustability. The new Adventure Rally’s adjustment system is a huge upgrade from the previous model. 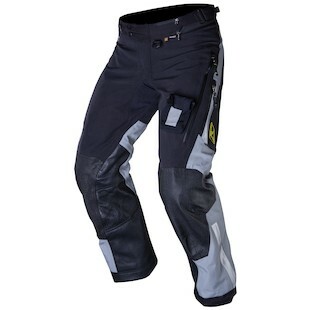 The previous Klim Adventure Rally Pants had little external adjustability which made for a bulky fit. The new Adventure Rally has external adjustments in the biceps, forearms, sleeves, waist, and hips. Having a tailored fit is crucial on long distance, demanding adventures. The amount of ventilation ports almost double in the 2014 Adventure Rally. More ventilation ports offer riders with more temperature control. Klim also updated the ventilation ports with YKK water-resistant zippers instead of the previous Gore-Tex Lock Out closures. The YKK zippers are easier to adjust on the go. The robust YKK zippers are also stronger than the previous Gore-Tex Lock Out closures. Finally, Klim focused on the smaller details to bring this system full circle. Starting with reflectivity, Klim incorporated 3M’s Bio-Motion Recognition panels which create a silhouette of reflectivity during dark nights and gloomy days. 3M tests have shown that reflective panels situated in the form of a human body are easier to recognize. Standard on all Klim gear is the well-known emergency ID pocket with a personalized ID card. Klim carried over the removable waterproof Leatt neck brace collar, 3L hydration pouch, heat-resistant leather inner leg panels, and bottom hem shock cord from the previous version. 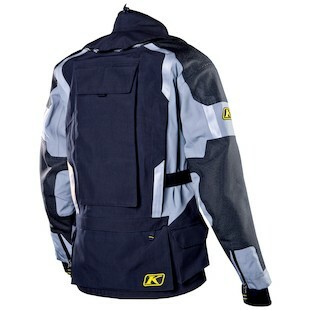 Finally, Klim updated the new version with a full circumference, jacket to pant, YKK zipper for a complete connection. The only thing this system is missing is a toaster oven...or is it? The Adventure Rally is a masterpiece. Every stitch has a purpose. If you only get satisfaction when your bike and body are pushed to their limits, the Adventure Rally could be your best friend. It’s up for any challenge you can throw at it.